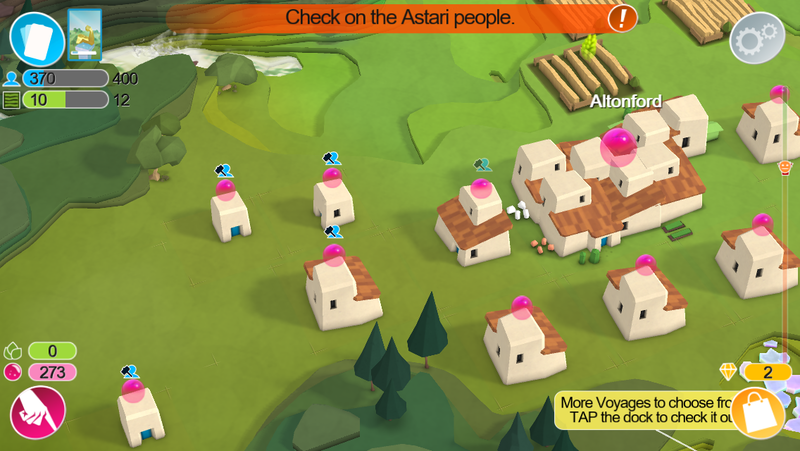 The new game Godus hit iOS recently and I was quick to check it out. It was created by Peter Molyneux, a developer known for projects like Fable, Black & White, and Populous, all games that stressed freedom and the ability to shape the world around you. This mobile version of the “god game” genre is a simple premise. You sculpt the land and lead your followers to build homes, farms, and other things necessary for your people to flourish. I’m including a lot of game photos to give you a good idea what that entails. Everytime you login, you’ll see your people and little pink orbs hovering over the establishments they’ve built. These pink orbs represent their belief in you, so you can click and gather all this valuable resource. This belief then powers your ability to sculpt the landscape and cause godly miracles (or disasters). 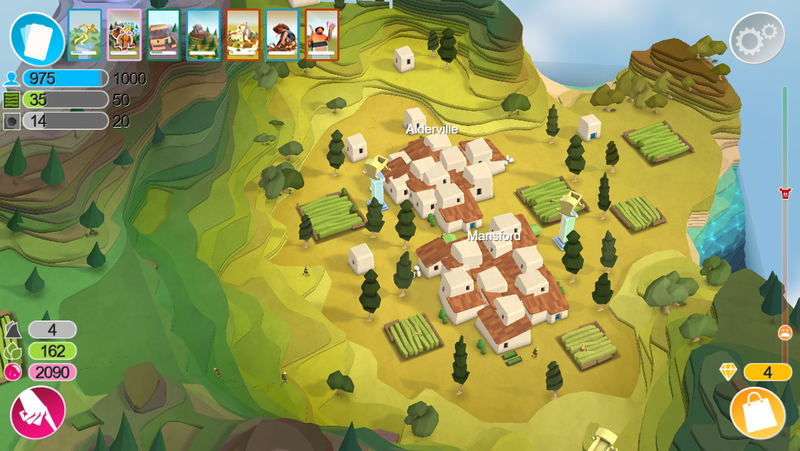 In addition to clicking for belief, you’ll also gather other resources, such as farms that give you wheat and mines that give you stone. When enough room opens up in your land, the nearby buildings will want to expand. For example, a farm might prompt you to build more farms, where a home might prompt you to build more homes. This means that there’s incentive to continually sculpt the land and create new pockets of civilization. The tricky thing is that both of the pictures above are included in my world but the little people might need to travel from one to another, so you’re constantly making sure that the ground is able to be traversed by your little followers. For example, you’ll see a staircase of sorts on the left above leading to some farms and also a staircase in the very top of the screen leading to another patch of homes. This is the trickiest part of this game. See… Your little followers aren’t very smart and will sometimes ignore perfectly good staircases and instead end up lost. You get a notification that says your followers are blocked. You click on it and it zooms to Holly, who somehow found herself on top of a mountain and can’t figure out how to get down. You can try to give your people new directions but you can handhold them to walk a certain path. And even once they unstick themselves, they often find their ways up there again. 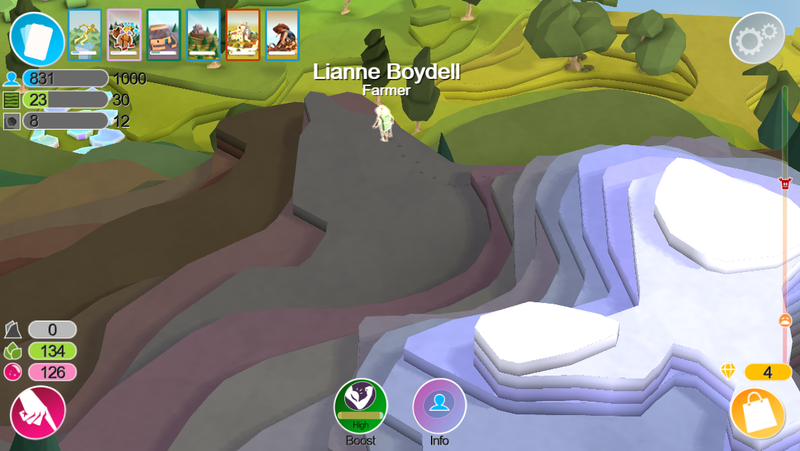 Like why is Lianna the farmer up there in the mountains? Get down Lianne! We’ll followup with Lianne later. “Is this all the game?” you ask. No, your civilization moves along the evolutionary track by unlocking new technologies. This is indicated by the upper left of the screen. Those cards are new abilities, buildings, etc, that you must unlock. 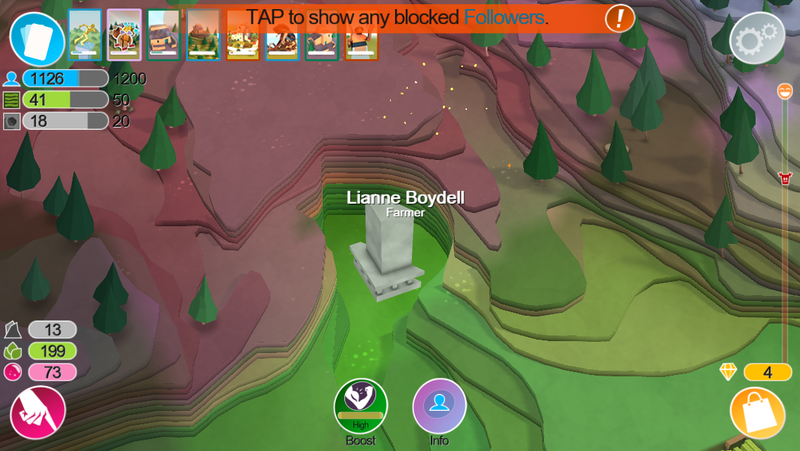 You unlock them using “stickers” that you find as you sculpt the land in small treasure chests. These stickers become rare in the late game, so you have to choose which cards to invest points into. Would you rather earn wheat faster or build larger homes? Now… do you see that right gauge with a red and yellow marker? That yellow face is how happy your followers are. Mine aren’t because frickin Lianne is stuck in the mountains and their god has apparently forsaken her. The red icon is the happiness of a nearby tribe that competes with you. When you have enough “belief,” you can head over to their village and turn the tables. This was a really happening party until I lit all their trees on fire and sent a meteor down onto their party. My happiness has shot up, see? You’ll see these angry guys every once in awhile as they taunt your followers. A slight nudge of the ground will send them running away, don’t worry. But aside from the flawed artificial intelligence of your followers, the next biggest fault is in the literal sculpting of the world. Imagine this screenshot on the size of your mobile device. Trying to pinpoint what layer of land you’d like to expand is a tedious and near impossible task. I expend most of my belief moving the land and then moving it back because I accidentally moved the wrong thing. It’s meant to be a precise tool but the touchscreen mechanic doesn’t allow that sort of pinpoint accuracy, so it becomes a game of blindly pulling and pushing the land until it does what you want. 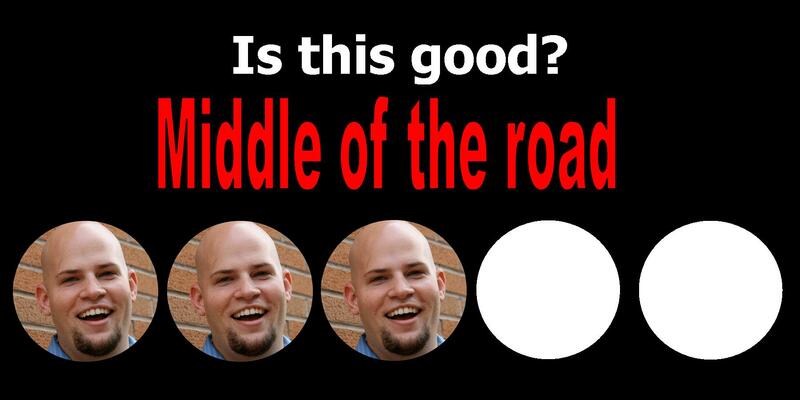 Usually it turns out okay but it can be a frustrating mechanic. 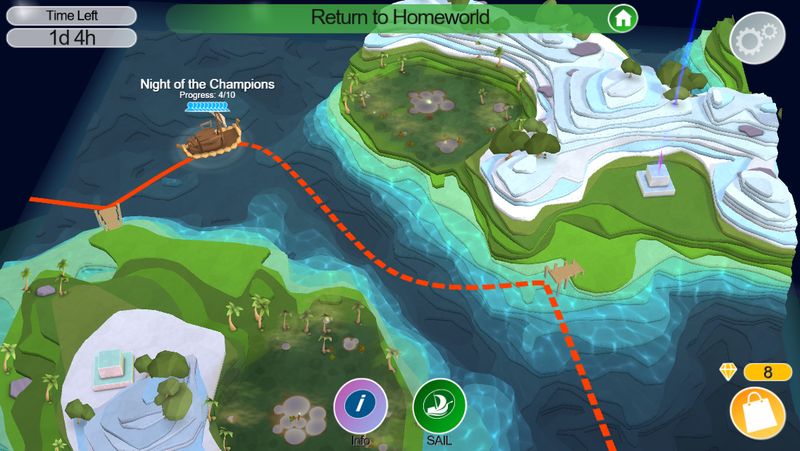 Another key component of the game is a mechanic where you send followers out on a boat to do remote missions in a certain time frame. For example, you’ll have three days to complete a series of puzzles. Each puzzle has you leading your people from one point to another, so you must sculpt the land to help them avoid hazards, such as dangerous giants or swamp gases. If you complete the puzzle, you get stickers to upgrade your abilities. These challenges are actually really difficult, as you don’t have time to really get the landscape ready. You hit start and your minions start walking. 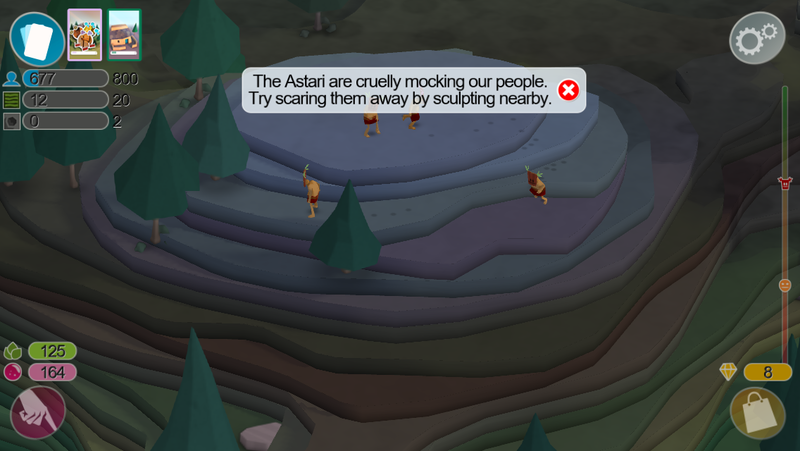 The sculpting is tricky so you’re unable to move the land to exactly where you need it to be, so your minions walk right into an angry giant. Failed. It’s frustrating and I usually avoid the voyages system. I think it’s about time we check-in with Lianne one last time and see how she’s doing. Oh, she’s stuck behind a column. That makes sense, way to go Lianne. So… Overall. 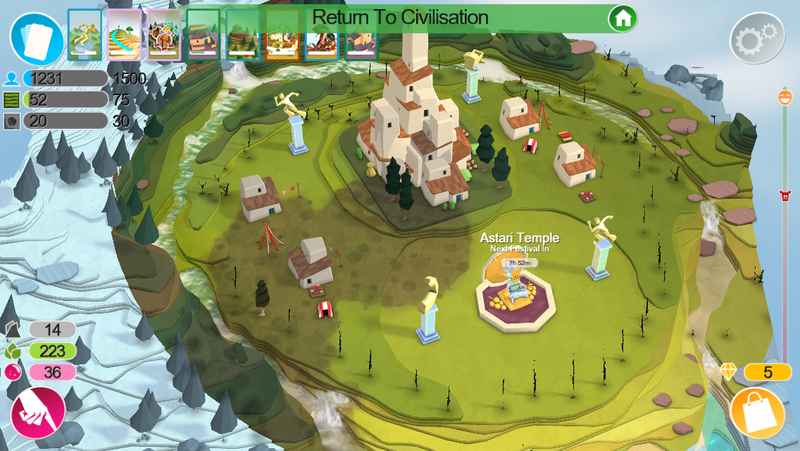 Is Godus worth downloading? 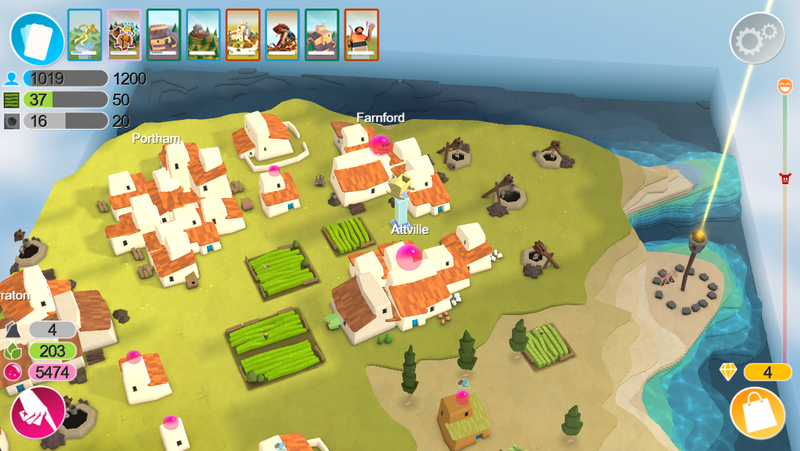 Godus is luckily completely free to play, it has an interesting spin on the civilization-building mechanic, and it’s fun to carve into the land and build a home for your followers. You can drop countless hours a day into this, if you’re looking for mindless and low-stress fun. However, you’ll find plenty of frustration as your followers end stuck behind objects and on mountaintops. The sculpting ability is super fun to do but its inaccuracy can be frustrating, especially in the timed voyages where a misplaced sculpt can cost you the mission. If you stick to the non-timed civilization mode, you’ll find things to enjoy here. 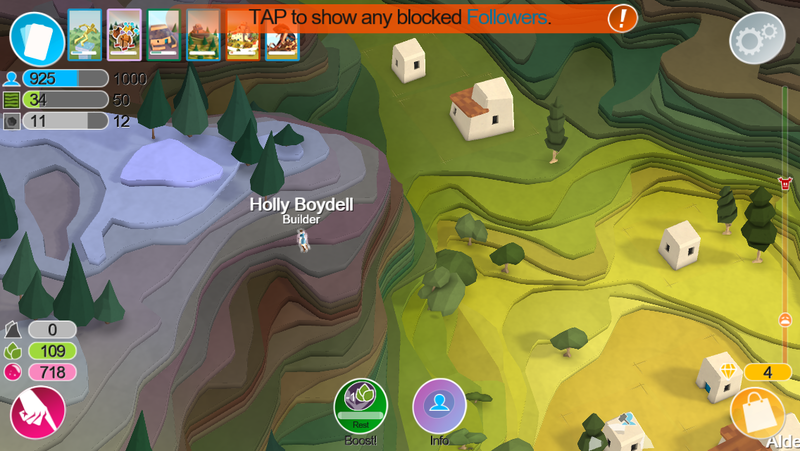 This entry was posted in Gaming, iPhone and tagged 22cans, adam ryen daniels, apple, god game, godus, godus review, i am your target demographic, iaytd, ios, mobile, mobile gaming, peter molyneux, review. Bookmark the permalink.